Destinology guides you to the best spots for fireworks and lasers, dinner and a party. Sydney, Australia starts the global firework parade followed by Hong Kong and Bangkok but this year Dubai is the hottest location to celebrate. 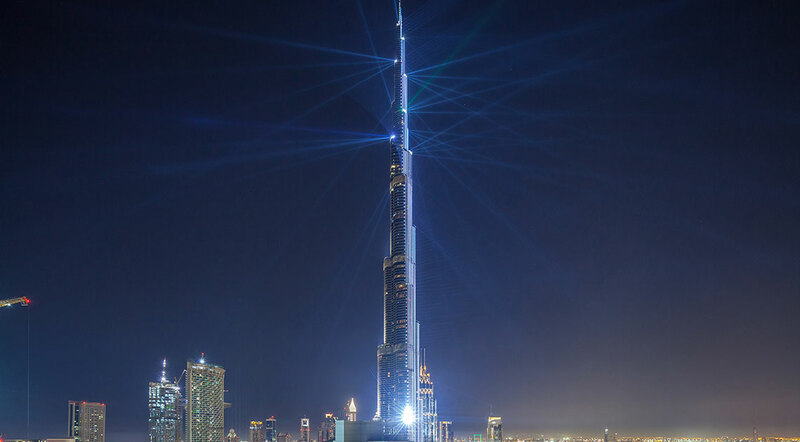 Following last year’s Guiness World Record breaking light show, Emaar are doing it all again starting on New Years Eve. The iconic structure of the Burj Khalifa and other downtown buildings including the Dubai Fountains themselves will become the canvas for an extravagant light and music show. The foot of Burj Khalifa and the waterfront by the Dubai Fountain are popular destinations for those celebrating New Year in Dubai. If you plan to be awed from this location make sure you arrive early, we recommend 18.00 hours and plan ahead as there will be road closures across the downtown area. Book one of the restaurants in the area now to avoid disappointment. Try Baker & Spice for Middle Eastern Cuisine, Serafina for Italian or Asado for some Latin American flavours. Spend New Year’s Eve on Kite beach with revellers from around the world. This a relaxed celebration venue, pack a picnic and a blanket and be sure to arrive early so that you can witness the multitudes of colours nature provides through her sunset. Average temperatures at night in December are 16°C so being outside will still be warm and sunset is at 17.39. 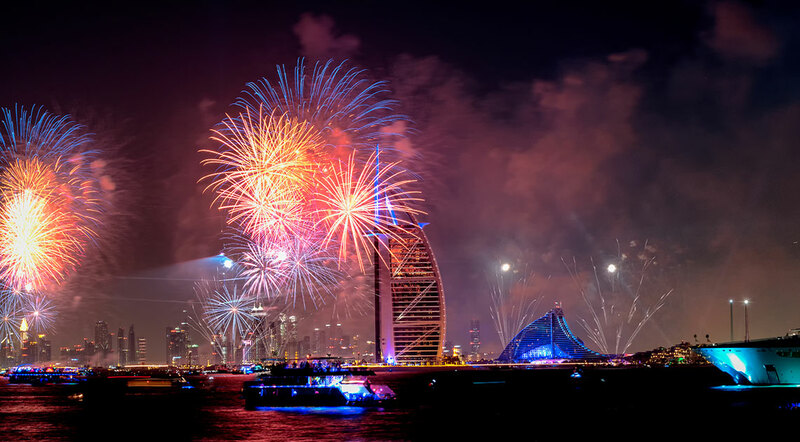 If the beach is not for you the Burj al Arab fireworks can also be enjoyed from the Madinat Jumeirah where you will find restaurants, lounges and outdoor spaces from where you can enjoy the show. Atlantis, The Palm looks like a Disney castle so imagine its magical structure crowned by sparkles and lights. 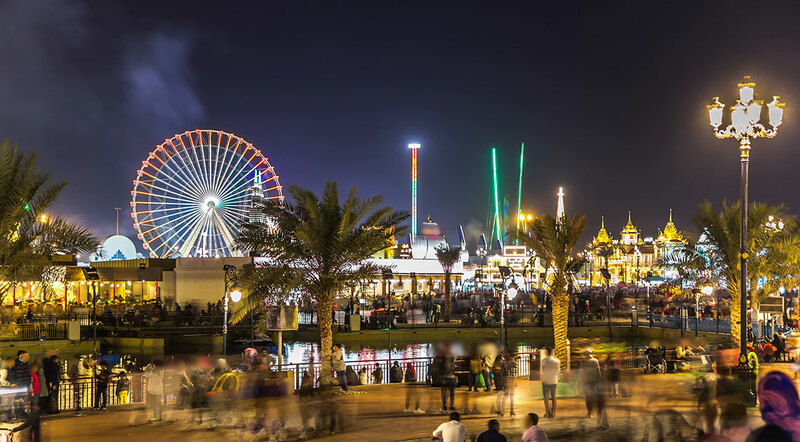 The boardwalk along the crescent of the Palm Jumeirah will be the place to be December 31st. From here you will be able to see the fireworks at Atlantis and the Burj Al Arab. 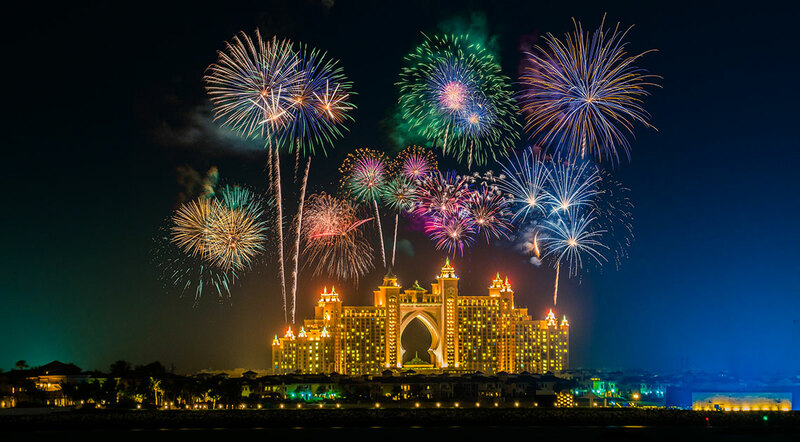 Hotels on the Palm with great viewing spots include the Jumeirah Zabeel Saray, Waldorf Astoria and the Ananatara all of which will be hosting New Years Eve events. 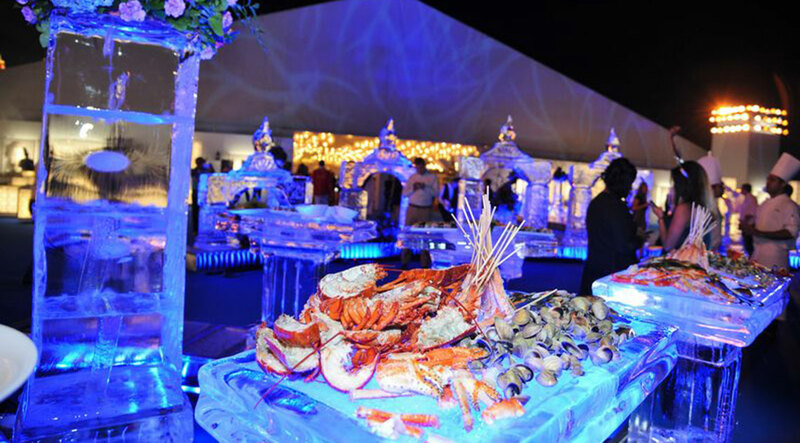 The Atlantis Royal Gala is being hailed as the celebration to rival all others. The evening starts with Champagne and canapes before the 30 piece, live band strike up and play until 03.00! Tickets include unlimited premium alcoholic and non-alcoholic drinks, including more Champagne, and a buffet that includes lobster, caviar and sushi. Obviously, a fantastic view of The Palm fireworks is guaranteed. Get the best vantage point..
Take to the water this New Year’s Eve and cruise on a luxury yacht. Dinner is all inclusive and is presented as an open buffet followed by a specially crafted desert. Music, dancing and un-interrupted views of fireworks follow. Yachts leave at 20.30 and return at 03.00. 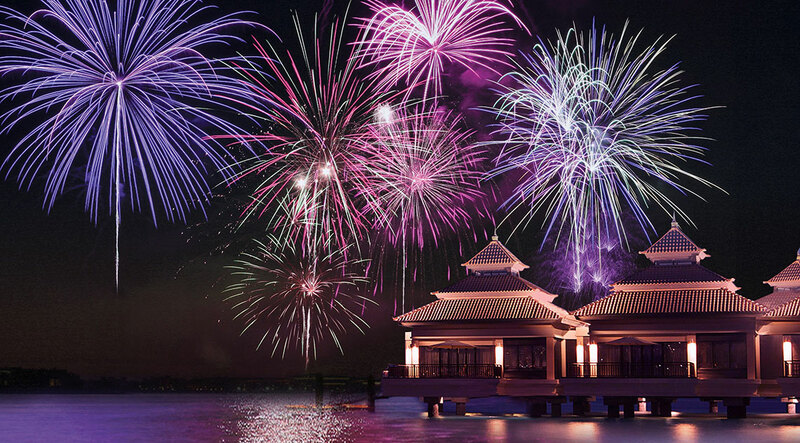 Enjoy New Year Celebrations at Anantara, The Palm from a range of venues – The Lotus Lounge, Mekong, Bushmans and our favourites The Beach House and Crescendo. At The Beach House they are serving an international buffet with live cooking stations and the party by the shore continues late into the night. At Crescendo drink and dance the night away accompanied by five piece international band Foreign Affair. Either venue offers spectacular views of the fireworks and celebrations. For something completely different head out into the desert for a Bedouin style celebration. Enjoy BBQ dinner with food from around the world. Champagne at midnight, New Year cake, music, folk dancing, fun games and fireworks. 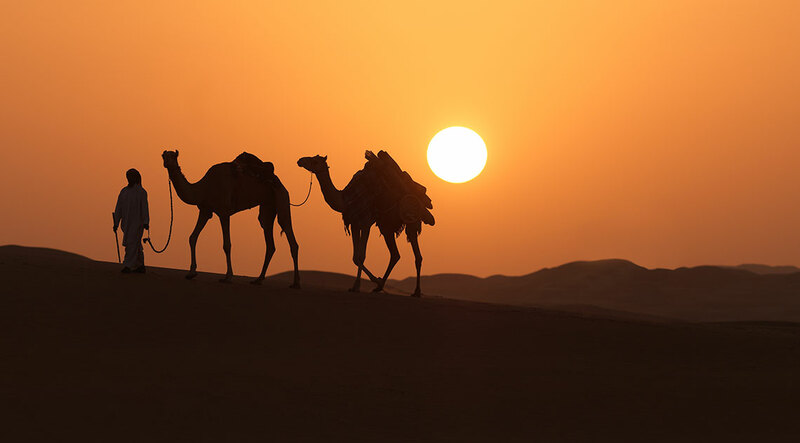 Enjoy the sunset on an evening desert safari and extend your stay with a party into the night. 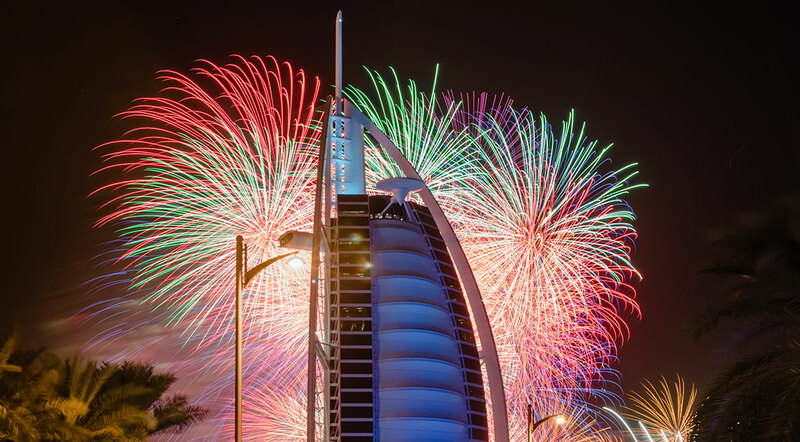 If you are not the partying type and want to avoid the crowds book a room with a firework view - there are many across Dubai. You can enjoy the spectacle of lights from the privacy of your hotel with a bottle of champagne and some soft drinks with your family - no matter how young they are. Perfect. And if that isn’t enough for a celebration…Shopping! 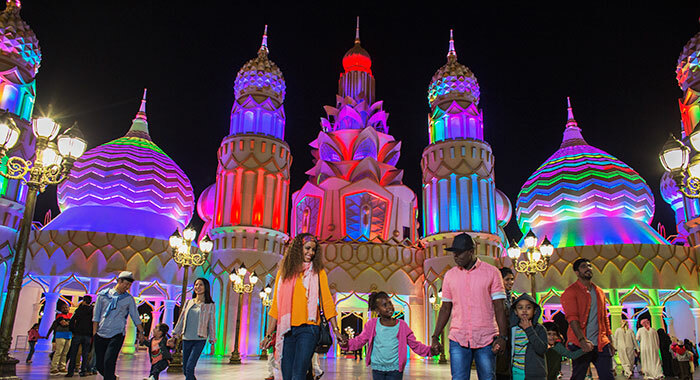 The New Year celebrations coincide with Dubai’s Shopping Festival at the Global Village. 75 countries are displaying crafts and foods through 30 pavilions. 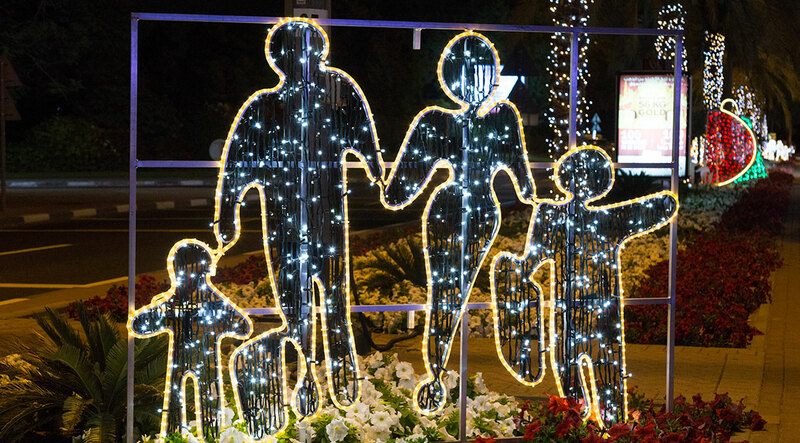 Lights, parades and shows are sure to keep you entertained and in celebratory mood.